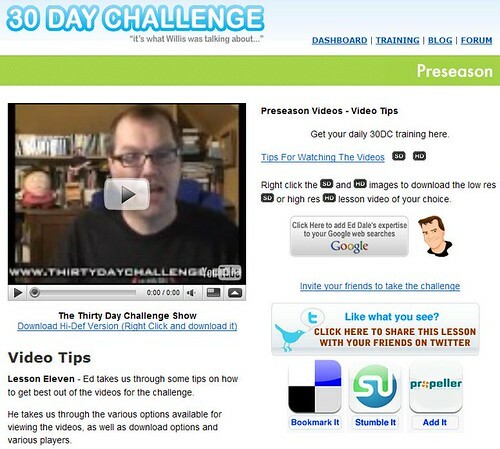 I thought it would be interesting to do a quick post, just before we begin the 2009 Thirty Day Challenge. Over the next 30 days, we’ll learn a lot – about a lot of different topics. We’ll hear about things like markets and niches, keywords and conversions – and one of those topics will be traffic. Now this blog is not really focused on conversions – it’s a resource, and as such it gets a little bit of traffic. From an average of about 300 visitors per month (September through May) to exactly 2,000 visitors in the month of July. When we’re learning about the important of bookmarks, directory submissions and backlinks, remember how important they really are when it comes to YOUR site’s traffic. If you are looking for ways to bring in some extra money, (and who isn’t these days?) then you need to take a look at these 5 methods for making money online. Bear with me for just a few minutes because these money making methods are pretty simple to implement, they do not even require any money, you don’t have to have a list, a website, or even any experience to do this. Now, it’s important to keep in mind, these are not get rich quick methods because, let’s face it, there’s no such thing. But the methods I am going to reveal to you are methods that hundreds of others have used to make money online. If you put in the effort, then very soon you’ll be making the money too. The first method is something that I am sure you have heard of, eBay has been around for years and it is still the biggest online auction site out there. Thousands of people are making their living selling on eBay and you can too. Take the time to learn all you can about selling on eBay. There are some great courses out there that can show you what you need to know. You can start by selling some of your own household items that you don’t use anymore. Then you can branch out by buying items at garage sales or auctions for re-sale on eBay. Some sellers even run consignments shops where they sell other peoples’ items and take a commission of every sale. eBay will be around for a long time and it is a good place to quickly and easily start making money online. The next method is through affiliate marketing. This is basically the method taught in the Thirty Day Challenge. All you need to do is find some great products online that have a good affiliate program and start promoting these products. You will get a percentage of every sale you make. Now this sounds simple in theory but it does take a bit of work. You need to find a niche that people are willing to spend money in and then you need to find a good product to satisfy the needs of that market. Then you set up a website or blog that promotes your chosen affiliate products and send traffic to the site to make sales. The Thirty Day Challenge shows you exactly how this can be done. Affiliate marketing can make you a very good living if you do it right. Another way to generate online income is to provide a service to others, particularly other internet marketers. If you are good at web design or writing then you can do freelance work for others and get paid right away. You can even become a virtual assistant and do work for someone else’s business from the comfort of your own home. These types of services are in high demand and you can easily get started in these areas. A spin on doing freelance writing work is to sign up for sites like Associated Content and Text Broker. These sites will pay you for articles that you write for them. You won’t make a huge amount of money doing this but it can be enough to pay a few bills and can quickly be done in a pinch. And finally, here’s a method that will take some time, but can payoff for you in a big way. Instead of marketing other people’s wares as an affiliate, you can create you own product and have affiliates working for you. The most profitable way to do this is to find a high-demand niche, solve a problem and then recruit affiliates to do your promoting for you. Think about how much money you can make if you were to have a hundred affiliates promoting your products. The beauty of this is that you do the work to create the product once, and affiliates keep selling it for you over and over again. If you want to get started building a business online or are ever in need of cash, try one or all of these methods. You may find that you will never have to worry about money again and you’ll have built a profitable online business. But I feel like I would be holding out on you if I held onto this knowledge – if I didn’t share it with you right now. Nothing seemed to be working – one dead-end test after another. But further testing reveals I’m off – something’s not quite right. Try as I might, I end up feeling like a BIG FAT FAILURE. She listens intently – sympathizing with failed attempt after failed attempt. I lie – and tell her “yes, of course dear.” And of all people – SHE reveals the secret sauce to me. Now, at my own peril – I’ll share the secret with you. Can you handle knowing the secret sauce? Seriously, if you don’t think you can handle it – you should stop reading now! She adds a little bit of this into about half of her cooking – and it makes all the difference in the world – that smokey, chipotle flavor was just what I was missing in my cooking. Conveniently, she had it tucked away in a different cupboard so I wouldn’t use it up. I know, I know – you probably thought I was going to give up a DIFFERENT secret sauce. Well, two things. ONE – You should know this – the secret to success in anything is: SELF-DISCIPLINE. Ask any successful person – self-discipline will be on their list of character traits. Along with that, I’d say success comes from characteristics like: focus, perseverance, hard work and integrity. So be disciplined about what you’re doing. Focus on one thing at a time. Ask yourself, “What is the one thing I should be doing right now?” For me, sometimes that’s research, write content, build back-links, make relevant comments, etc. Just pick one thing, one aspect and do it – finish it before you move on to the next thing. Work hard – if you’re going to spend time doing it – give it your all, 100%. At the end of the day – do it well and do it with integrity. Now you might say using the term “Secret Sauce” as a headline might be misleading – maybe – but you did learn something and hopefully you were entertained too. TWO – If you’re a thirty day challenger, veteran or newbie – once you’ve gone through the initial 30 day challenge, the next logical step is to take it to the next level and join the thirty day challenge plus. There’s new material included each month – however the materials are taken down at the end of each month. So if you want to take your own awesomeness to the next level, join as soon as you can. It’s the pointy end of Preseason and this will be one of the last of the technical videos. This one promises to be an easy one. 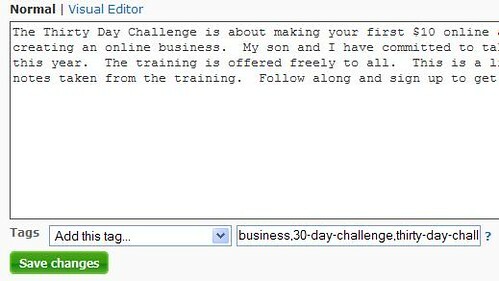 The actual Thirty Day Challenge Training pages will look basically the same. There may be some subtle changes to the look and feel of the pages going forward. But the overall design and functionality should remain the same. During preseason, this video hasn’t always been an overview video. Sometimes it’s been an update or a Thirty Day Challenge TV episode. Regardless, it usually comes from YouTube. You can expect to get an idea of the materials that will be covered that day, maybe some goal-setting – or some tips to help you avoid potential hurdles. Below that video, there is a link so that you can download the video to your computer. If you right click on the link – a menu will pop up, and you’ll be able to “Save Link As…” – from there your download dialog will pop up and you can download the video. I can create additional folders and organize as we go for easy reference later on. In the meantime, if you at least have a separate folder to download 30DC materials, that’ll be good. Over on the right hand side – these are the core videos for the day. There may be one, two, three…..Did I just hear him say 75???? Okay, he’s just kidding, whew! Regardless, we have a few options here, so let’s explore them. The first link will take us directly to the YouTube version of the training. 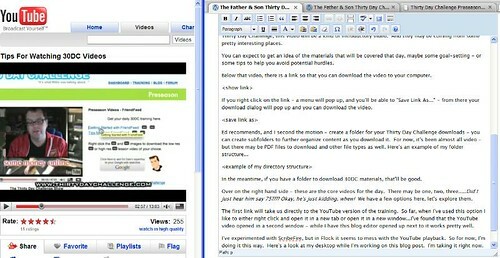 So far, when I’ve used this option I like to either right click and open it in a new tab or open it in a new window…I’ve found that if I have the YouTube video opened up in a second Flock window (not a tab) – while I have this blog editor opened up next to it – that works pretty well for me. I’ve experimented with ScribeFire, but in Flock it seems to mess with the YouTube playback. They’ll probably take care of it with an update soon enough. So for now, I’m doing it this way. Here’s a look at my desktop while I’m working on this blog post. I’m taking it right now. I guess the point I’m trying to make here is – you can watch a video and work on some aspect of the training. I pause the videos, rewind, and replay many times to make sure I’m understanding everything Ed is teaching. 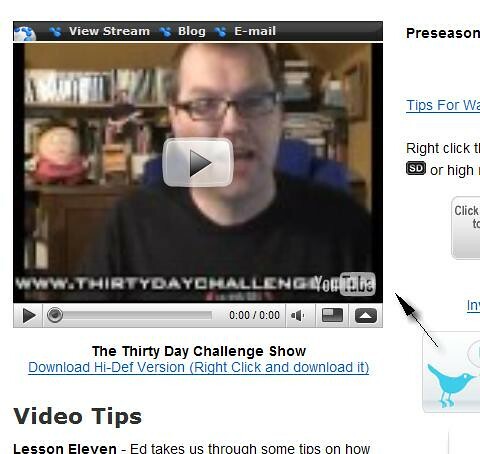 Using YouTube also allows for the possibility of watching the training by way of AppleTV and Tivo – you just have to “subscribe” to Ed’s YouTube channel. If you need a refresher on that process, it was covered in the “Using YouTube” lesson. One last cool thing about the YouTube videos is – the ability for people to use them in their blogs – like me. Man, I like YouTube! The SD button more or less stands for “Standard Definition.” It’s a lower quality file that has been optimized for an iPhone or iPod – and it looks fine. The HD button is the High Definition version. It’s the Rolls Royce of the video files. If you have the bandwidth and the space – the HD version is the way to go. In any case, you can right click on the link or button of your choice and “save file as” to download the video training to your computer. Let’s look at http://www.revver.com/ – this site displays the high definition version of the video. Why have the videos available in so many formats from so many sites? Some places in the world block access to YouTube and some other video sharing sites. This way you have some options and a way to get the training no matter where you are. 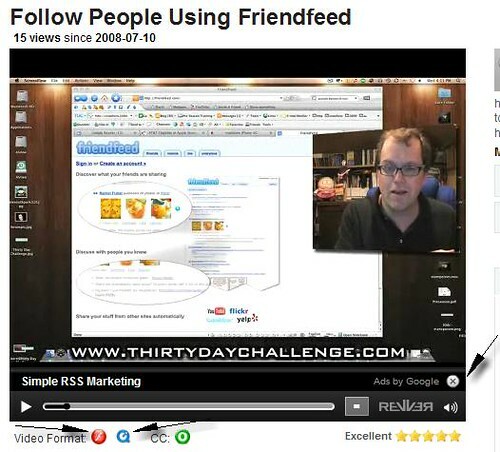 If you’re having trouble getting or viewing the videos – you can always ask a question within the Thirty Day Challenge Forums or leave a comment/question here. That covers the basics of our video download options. So now what? One of the easiest ways to manage the video content is to use iTunes. iTunes works on MAC or PC – and it’s free to download iTunes. Once you’ve got iTunes opened up – you can create a 30DC playlist within iTunes. 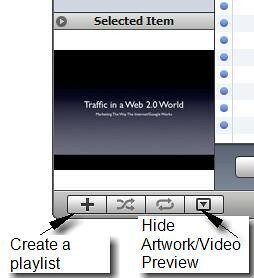 From there, you can either drag and drop the file into the main iTunes window – but the most effective way to do this is to drag and drop the file right onto your 30DC playlist. You’ll see there that the file you just downloaded shows up in that playlist. Now, if you connect an iPhone or video iPod up to your iTunes – you can sync your 30DC playlist to the device and have your training videos with you wherever you go. Well, wherever you take your video device. You can display the video down in the lower left corner (the hide/show button) – you would probably want to double click within the actual video preview window to expand it for better viewing. So – iTunes offers one way to easily view and manage your video content. 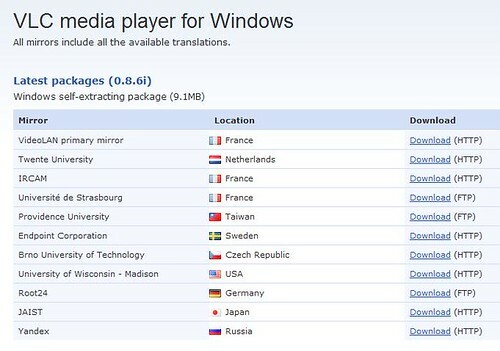 Another video option is available from VLC media player. 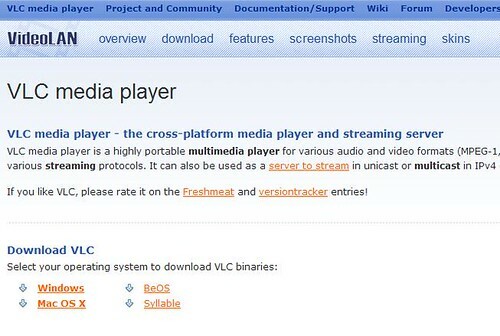 It’s a simple but robust media player – and it’s free! It might be an excellent alternative for people with older computers and/or minimal system resources. Just click on the link for your operating system to go to the download page. The VLC interface may not be quite as user friendly as iTunes, but it WILL do the job…and the price is right! That’s really it for video tips today – you can play around with YouTube, iTunes and VLC media player. Decide what works best for you and for your system. Because of the way things are organized this year – you should be able to find the tools that work best for you. Today, as the video opens with some awesome sounds from a V18 amp head in the background – Ed lets us know, we’re going to be learning about StumbleUpon…take a look at the video below. This lesson is kind of a tough one to do, and the reason for that is StumbleUpon. It’s a powerful tool, it’s very cool – but it can also be a bit of a distraction. You’ll see what I mean. Basically, if you’re in a “discovery” frame of mind – or looking for ideas, StumbleUpon is a terrific way to go through the internet looking for things you like. It gradually gets to know the things you like and the things you don’t like – and comes up with some real gems based on your preferences. The longer you use StumbleUpon, the better it gets at serving up sites that you’ll like. 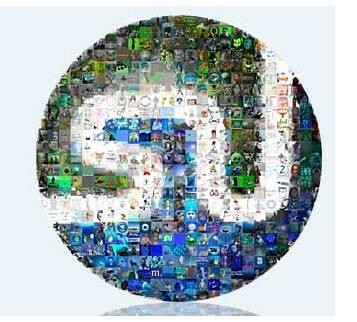 StumbleUpon also has awesome potential for internet marketing. We’ll learn more about that as we get into the actual Thirty Day Challenge. Like many social bookmarking sites, the more a site gets a positive rating – a thumbs up – the better it is. 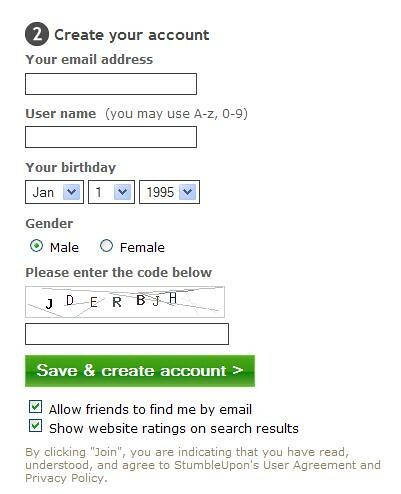 This ranking system works very well to connect users with sites based on their preferences. We can utilize that to bring attention to our sites as well. This should be mentioned now, Ed and the Thirty Day Challenge Team is operating under the assumption that your content adds value for the reader, offers up a solution to a problem or just plain makes somebody’s day. If it’s none of those things, social bookmarking will work against you and eventually lead to your demise. Take this site for example – does it add value for you the reader? I hope it does. I hope that you’re watching the training videos in their entirety – and then I’m hoping these notes add value as a reference tool for you. Do these posts offer a solution to a problem? Well, that may be debatable. But it probably solves a problem for some people. By posting summarized notes on the thirty day challenge – I’m creating a reference tool for my own use that I expect will also become a reference tool for other thirty day challengers. Does finding a resource like this make your day? Only you can answer that one – but I’d like to think I made your day a little bit better. Whether I did or didn’t – please let me know in the comments area below. StumbleUpon, and sites like it want to add value for their users – and because of that, they don’t want to be victimized by spammers. So they look closely at how people use their service. If you want to avoid being lumped in with the spammers, don’t spam. Learn how to use social bookmarking sites the way they were intended to be used. Let’s Get Ready To Stumble!!! Now, I’ve been holding off on this – and I’m glad I have. To review, back in the post “Extensions To Install In Flock” one of the extensions we installed was the StumbleUpon toolbar. Now, let’s get it fired up. My user name is SteveH2008 – feel free to look me up if you’d like to be my StumbleUpon friend. Now We’re Ready To Stumble!!! The Thirty Day Challenge is all about taking action – so let’s take some action now. Go ahead, click the Stumble! button. 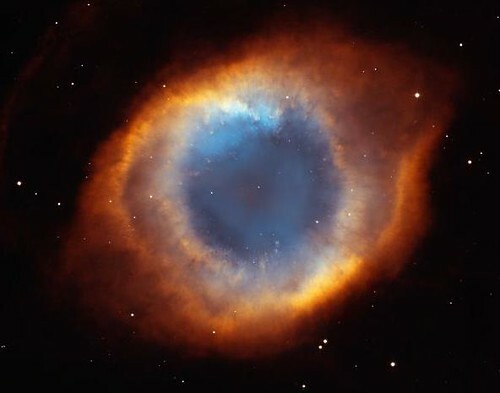 This comes from www.wikisky.org – a picture of the Nelix Nebula. What do I think? Do I like it or not? Enough of my little personal digression…let’s get back to the rest of the lesson. What if I didn’t like it? Well, I could just click on the “thumbs down” button. Does that deal a devastating blow to someone’s content? Not really, it’s mainly a way for StumbleUpon to serve up websites that I would actually like. If you use this in a genuine way, any time you come across a page or a post or content you like – you should get into the habit of clicking the “I like it” button. Now, as I click the Stumble! button – I’ll be going through pages that have already been “Stumbled Upon” by someone. What if I come across a piece of content that hasn’t been “Stumbled” before? So – that will become part of my routine. In addition to writing up my notes, once I publish the post – I’ll start using the “I like it” button to add my posts into StumbleUpon. From here, I can locate the site I just posted. I click on the “edit” button in the upper right corner of the entry. The editor allows you to edit your description, and also add tags at the bottom. It seemed to limit me to 5 tags, I’m not sure if that’s consistent within StumbleUpon. But I wasn’t able to get more than 5 tags to save or display. Take that for whatever it’s worth. Once I was finished adding tag, I just clicked the “save” button. Of course, if you’d like to practice using StumbleUpon – feel free to click YOUR “I like it” button while you’re still reading THIS post. If it’s already been “stumbled” – that’ll be all you have to do. If you happen to be the first to “stumble” a post – well, you may end up writing a description and selecting a category and tags too. Now, the homework Ed assigns is pretty simple. Spend some time, maybe an hour or so – and Stumble. Click “I like it” for the things you like, and click the “Thumbs down” button if you come across something you don’t like. 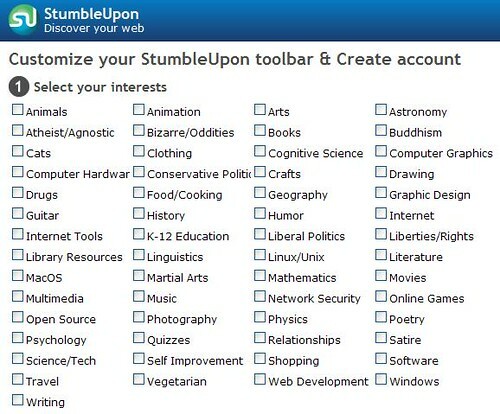 This will help you get to know StumbleUpon better AND will also help StumbleUpon get to know you too. Keep in mind as you start stumbling – use it the way a person would use it, not as a “marketer” would use it. It’s like a bank account. By “stumbling” sites that you enjoy – it’s like making a deposit to your account. If you “stumble” one of your own posts – it’s like making a withdrawal. Make sure you don’t overdraw your account. That’s something a spammer would do. Let’s wrap this up with a look at the “Channels:” section of your toolbar. Notice the “Globe” icon – that one randomly takes you through everything. You can Stumble through images. You can Stumble through videos. You can Stumble through a list of popular websites, like YouTube or WordPress or Flickr – the drop down menu gives you a lot of options. You can Stumble through News Items. And the “All” drop down menu give you a host of ways to filter through the items you Stumble. One thing I noticed – when I’m on this tab in my browser, editing my WordPress blog – the WordPress icon appears to the left of the Globe icon. If I switch tabs to a YouTube video, the YouTube logo appears there. When I switch to my Flickr tab to grab one of my screen captures – the Flickr logo appears in that place. So go have some fun getting used to StumbleUpon.